I cannot remember the last time I was this excited (also nervous) about going on a trip. In 4 weeks, my husband Gabe and I, along with another couple, will be on a 27 hour flight (god help me) to Thailand! Thailand has been on my bucket list for as long as I can remember. This goes back to when Leonardo DiCaprio starred in The Beach, circa early 2000. Last fall, when our friends asked us if we wanted to go to Thailand, it was the quickest I said yes aside from the night I was proposed to. When that conversation happened back in September, the trip felt like a lifetime away. We limited our travel leading up to the trip, reduced spending wherever possible, eating home more often than not and I've been selling stuff on Poshmark, all so we could take this trip without putting anything on a credit card. It's working out pretty well! To date, we've paid for all the hotels and our flights in cash, plus we have money to for daily activities. I've sold over $300 this month on Poshmark, selling things that have been sitting in my closet (easiest money I've ever made and I've become rather obsessed with selling stuff). Usually we don't have this much time to plan a trip so I have been going a little OCD with the travel planning. Below is a brief overview of our itinerary. 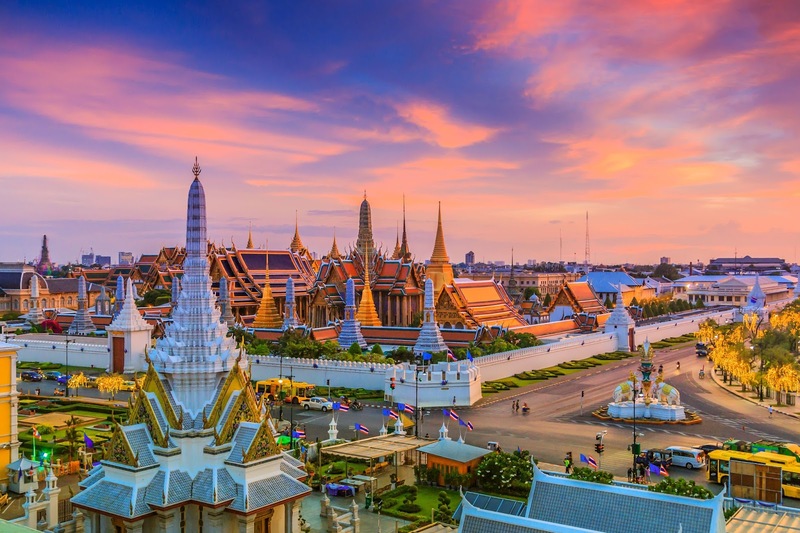 We are open to any and all suggestions from friends who have visited Thailand before (however, our destinations are set in stone as everything has been paid ahead of time with no cancellation....so please don't tell me to go to Chiang Mai - we dropped the ball there). I have no idea how we will feel landing in Bangkok at 5:30am after being on a 27 hour flight. I'd rather not think about it actually. If we get out of customs and into Bangkok by 8am, we will do a day trip to Damnoen Saduak Floating Market. We will dedicate one day to see the temples seems really packed, but from what I've read, very doable if we start early. I'm very excited about visiting Wat Pho - it is the home of Thai Massage school. Guess what an hour Thai Massage costs there....$13. 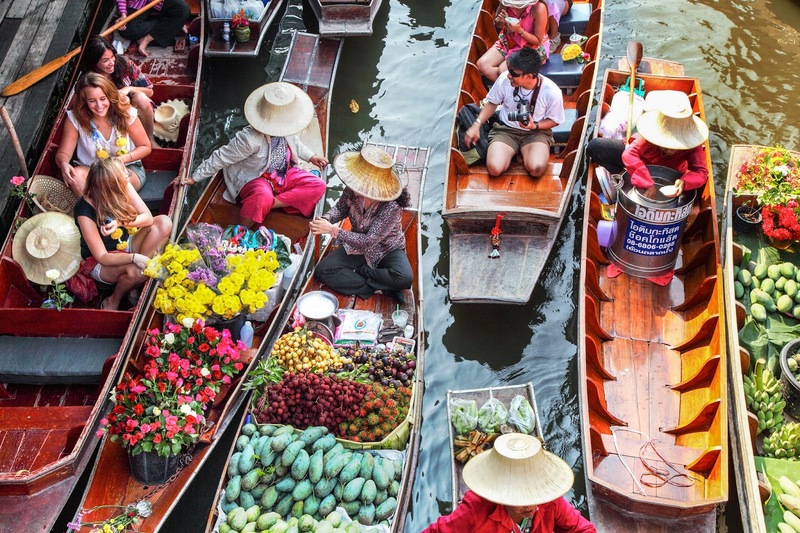 Also while in town, we are excited to check out the Chatuchak Weekend Market which is the worlds largest weekend market. Basically, we will be spending time in Bangkok doing a lot of shopping, visiting a lot of temples and a lot of eating & drinking! I can't tell you how excited we are about staying at The Float House River Kwai in Sai Yok. We "splurged" on this stay....splurging in Thailand means spending over $100 a night. 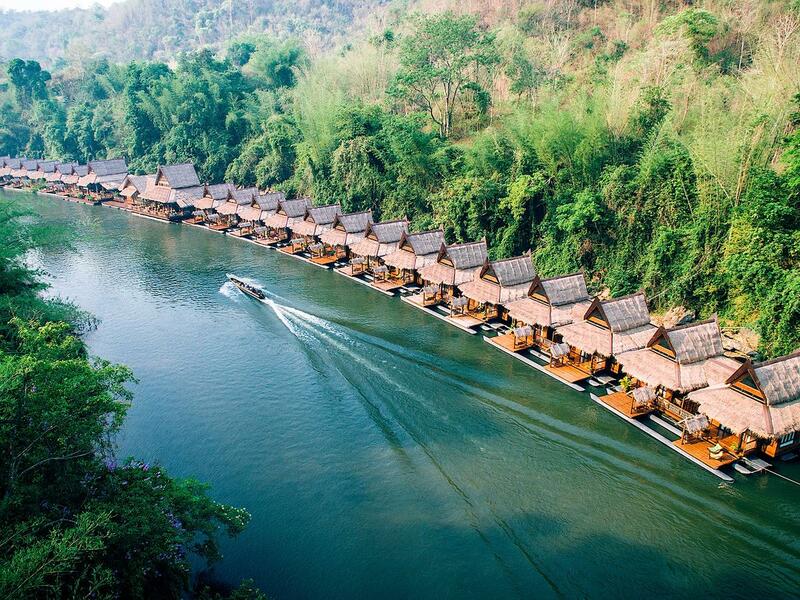 The Floathouse River Kwai has villas on the lake, surrounded by tropical forests and mountains of Saiyoke. The floors lead right into the river with a floating deck. I can see our 2 nights here spent drinking wine and relaxing. Of everything we are doing on this trip, this is the one place my husband keeps bringing up. He's very excited about staying in a villa on the river! 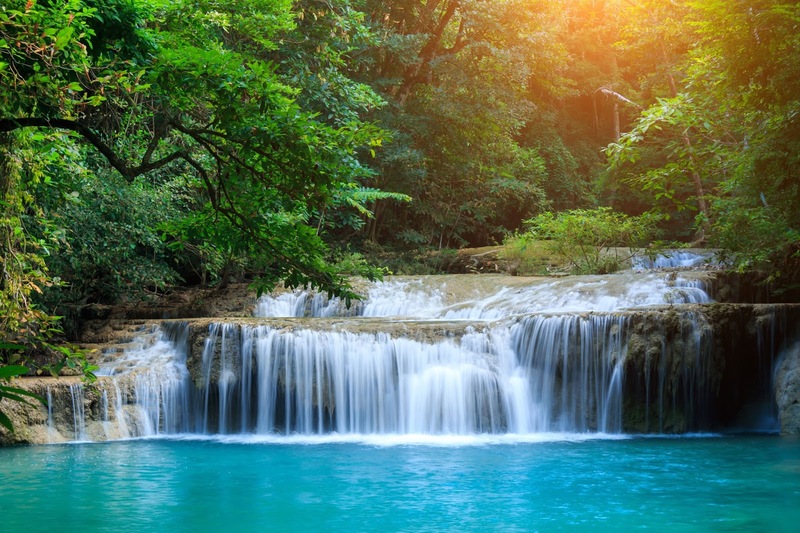 We are going to visit Erawan Falls which is an hour away from The Lake House River Kwai. 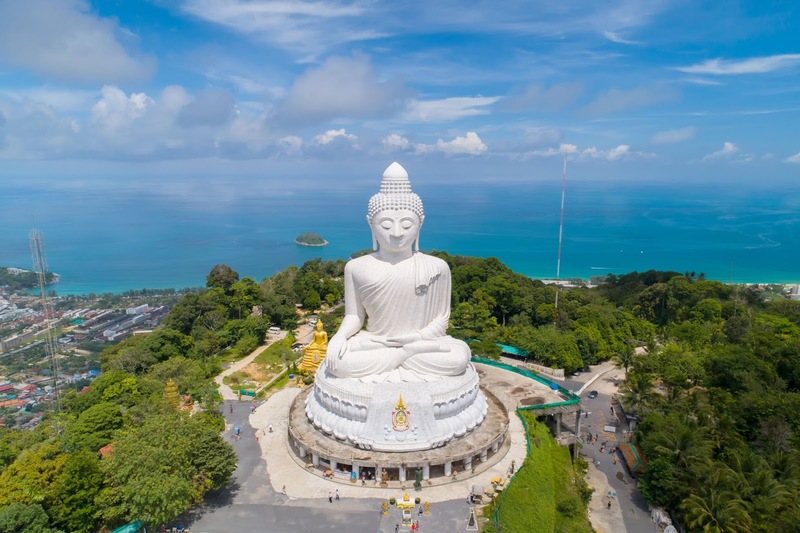 There are a few other "must see's" in proximity to the resort that we will check out but we are really looking forward to a few quiet days before heading into the chaos of Phuket. I've had a lot of people ask why we're spending so much time in Phuket. Easy answer, the ease of being able to Island hop. We also like to party and Patong is known as a huge party town but the location we chose to stay here isn't the rum buckets, it is the ease of island hopping. In Phuket we will visit James Bond Island on an sunrise trip and see where The Man with the Golden Gun was filmed. We are spending half a day at an Ethical Elephant Sanctuary, bathing and swimming with Elephants! Gabe will get to go surfing, which was the one thing requested for the trip. 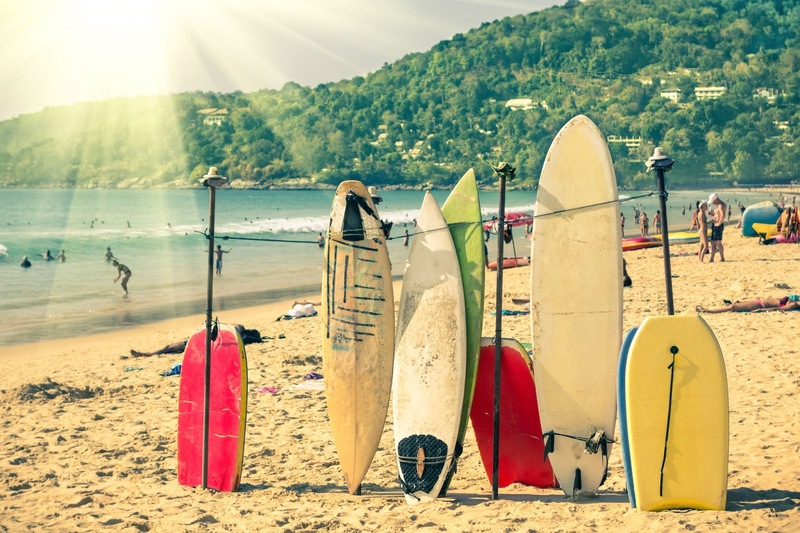 Thailand will mark the 4th country he has surfed in! We will also make sure to check out the other side of Phuket in a city tour (it's more than parties and beaches!). I am looking forward to seeing the colorful buildings of Old Phuket Town and we may fit in a cooking class. I'm sure there will be late nights and too many drinks in our future while in Phuket as well. We will be bringing The Morning Recovery Drink! 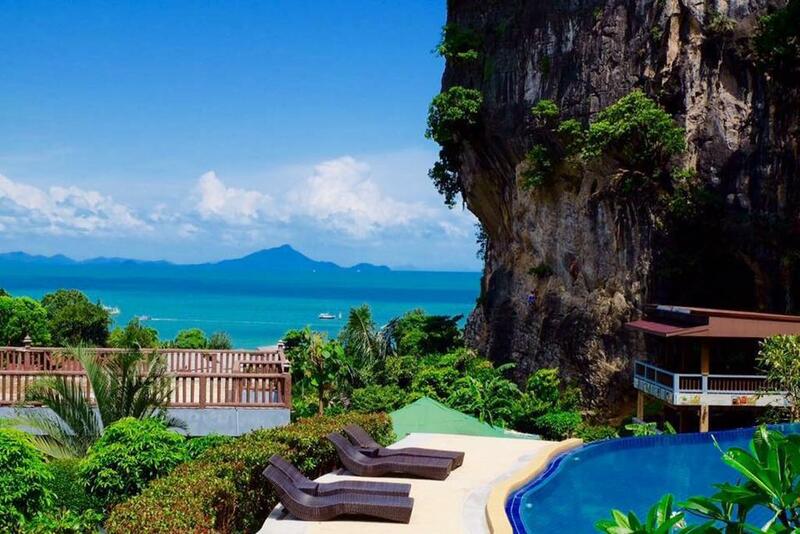 We decided to book a hotel in Railay without researching much into it. Now it's paid in full and we found out we are on an island with no cars, only accessible by boat! I am the research queen, not sure what happened there. 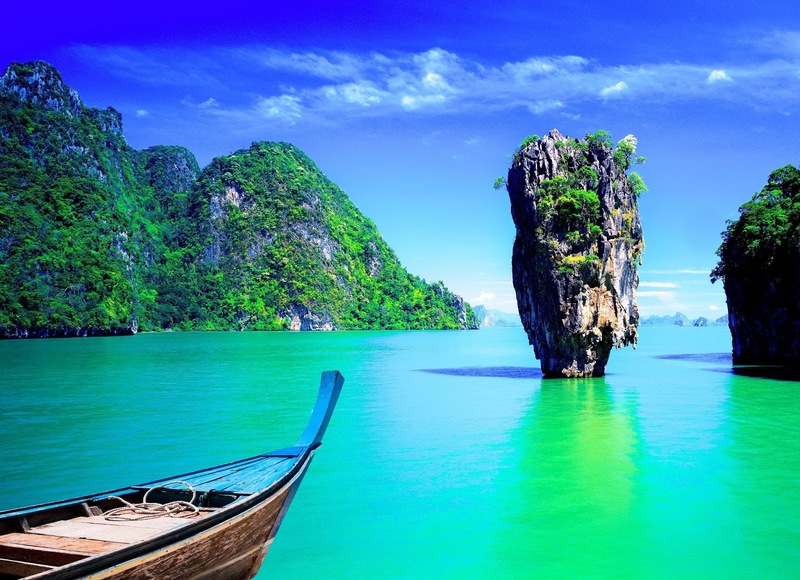 However, Railay is said to be one of the most beautiful beaches in Krabi. It's also low key, which is probably what we will need after 5 nights in Phuket. Plus the infiniti pool at our hotel is ridiculous, and we got an deluxe ocean view room for less than $60 a night. 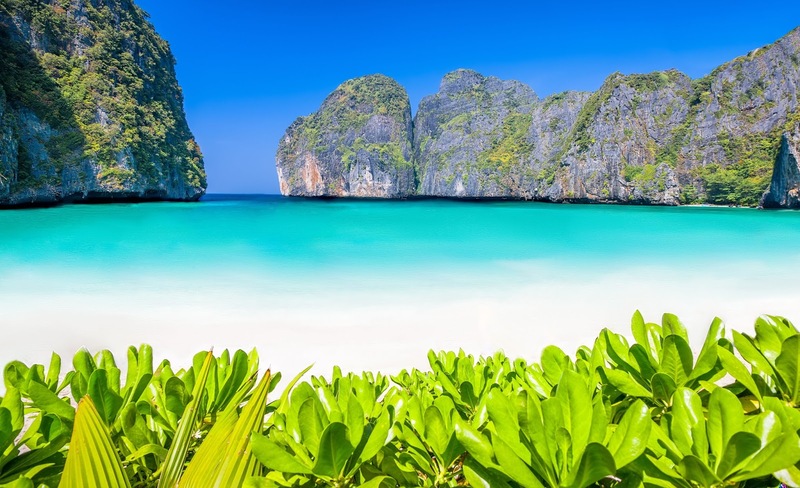 While here, we will visit Phi Phi Islands, including Maya Bay (the location The Beach was filmed). We are booking an early bird tour so we avoid the crowds, which I've heard are quite horrendous mid-day. Maya Bay is actually closing down on June 1st for the first time to tourists so they can recover and regrow. I would have been heart broken if we went to Thailand and weren't able to visit Maya Bay. We also found out we can do a very popular tour in Krabi on our own. 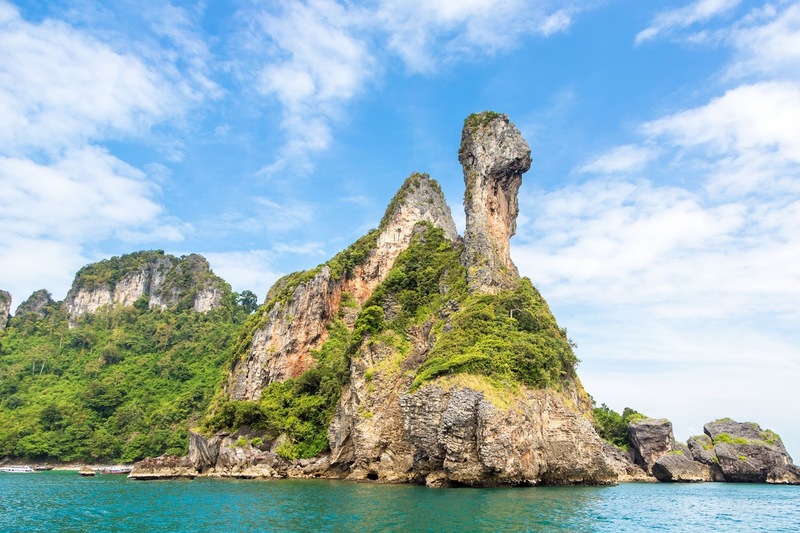 The 4 Island Krabi Tour usually costs $50 a person, but we can rent a 1/2 day self-guided tour for $50 total and can bring our own drinks (we'll be visiting Chicken Island, Koh Mawr, Tup Island, Poda Island). We will have the flexibility of going at our own time and not being with a mass of people. Plus as I mentioned, BYOB! I am not 100% sold on going to the Emerald Pool & Krabi Hot Springs, that is something we will decide when we arrive. I think I've read up too much on those destinations, and when I learned people bathe there on the weekends, the magic was lost on me. Our friends will remain in Asia after we head home, so we have a few days to ourselves in Bangkok prior to returning to the US. We are going to attempt a half day trip to the Historic City of Ayutthaya. Our last 2 days in Bangkok will be a whirlwind as we don't arrive in town until 2:00pm Thursday and fly out at 8pm Friday. 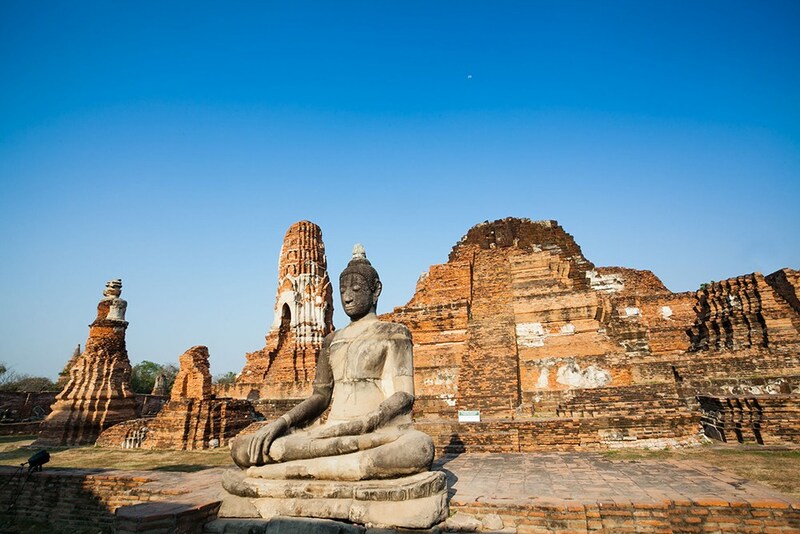 However, we will try everything to visit Ayutthaya as I've heard great things from other travel bloggers! Hard to believe this trip is almost here!